The second annual “A Taste of Golden” happens Monday, April 27 at the American Mountaineering Center. Enjoy some of the best dining in Golden with 20 restaurants, breweries, and distilleries showcasing their best recipes, micro-brews and spirits. Not only will the food and drink entice you, there will be owners and employees on hand to meet you and talk about what’s new at their business. Don’t miss the chance to meet Golden area businesses face-to-face. Look for the “Golden Ticket Merchant” tag for savings when visiting the business. Pangea Coffee Roasters is the new kid on the coffee block. Pangea is convenient to Clear Creek History Park and Golden City Brewery. You can see their roaster in the sitting area and their pastries are the perfect complement to fresh roasted coffee. State 38 Distillery’s spirits are crafted from organic raw blue agave and crisp Rocky Mountain water. This boutique distillery’s name celebrates the birth year of Colorado, 1876. AC Golden Brewing Company is a subsidiary of MillerCoors, a joint venture between SABMiller and Molson Coors Brewing Company. It serves as a specialty brewing arm of MillerCoors. Bridgewater Grill is set on the banks of Clear Creek, and patio seating is hopping in the warmer months, especially during the Clear Creek Concert Series, or live jazz Thursdays. Golden Ticket Merchant. Tin Star Smokehouse has a slew of BBQ selections, and for something different try their apple smoked salmon roll or the green chili mac and cheese! Simms Steakhouse – Steaks and fresh seafood in a contemporary setting with an awesome view. Snarf’s hearty sandwiches are freshly made at their downtown Golden business. Drop by when you’re in town for your next fishing, kayaking or tubing activity on Clear Creek. Golden Ticket Merchant. Bob’s Atomic Burger’s menu offer daily specials, scrumptious burgers and old fashioned shakes to sip. Golden Ethics award Winner and a Golden Ticket Merchant. Cannonball Creek Brewing Company keeps 6-12 rotating seasonal taps on at all times and Solid Gold Belgian Golden almost always on tap. The brewery name reflects their home town; it’s named for the majestic Clear Creek that runs through the center of Golden! Golden Moon Distillery produces premium hand-crafted herbal liquors and liqueurs using the best available herbs, spices and botanicals using the same type of artisan production processes utilized by distillers in the mid-to-late 1800s. Golden Moon Speakeasy is a speakeasy style cocktail lounge and distillery tasting room featuring classic and modern craft cocktails, pre-prohibition style punches and long drinks. A Golden Ticket Merchant. El Dorado Mexican Restaurant has a great patio where you can enjoy mountain views while feasting on made from scratch Mexican food and drink specials. A Golden Ticket Merchant. Coors Brewing Company the largest single site brewery in the world and home to the original Coors Banquet Beer. A hallmark in Golden history. Mountain Toad Brewery named after the Rocky Mountain Toad, a playful character that lives along the riverbeds, canyons and marshes of Colorado. At any given time they have 10 beers on tap: house standards and rotating seasonal / experimental beers. Beer list updated weekly. Ali Baba Grill serves fine Lebanese and Persian Cuisine conveniently located in north Golden. Dagatto’s Panini Bistro has become well known for their Italian style dinners and their friendly staff. With a Certified Specialist of Wine at your service, the Dagotto’s Wine List is undoubtedly second to none and the “Italian Dinner & Wine Tasting” held on the last Friday of each month has become a premier event. A Golden Ticket Merchant. The Briarwood Inn has one of the most iconic views in Golden. 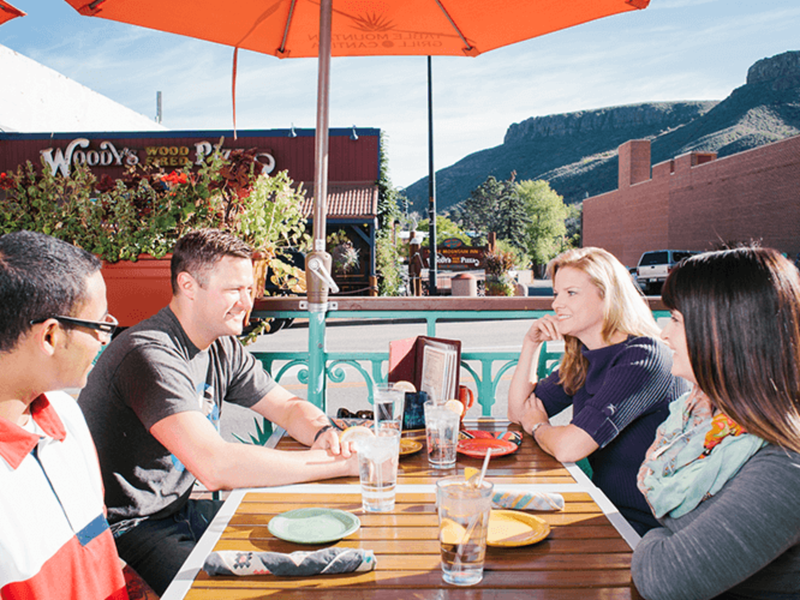 Lookout Mountain is nearly in their backyard and patio seating in good weather is an awesome choice. The Briarwood Inn is a Golden tradition for any occasion. A Golden ticket merchant! Barrels & Bottles Brewery has fun patio seating at the tap house and premium-style, hand-crafted beers along with special Guest taps. This Golden brewery has wine by the tap and the bottle. Order tapas-style fresh baguette plates to daily-made spreads. Furry pets welcome on the patio. Golden Ethics Award Winner and a Golden ticket merchant. Mahnke Auto Body is a top-rated, family-owned premier auto collision repair center located in the Golden area for over 30 years. They pride themselves on their customer service and their quality of work. Perkins Restaurant & Bakery Inside each Perkins family restaurant is an in-house bakery serving freshly made pies, muffins, cookies and more! Goozell Yogurt & Coffee is right on the corner of 12th and Washington Avenue. They offer comfortable outdoor and indoor seating and the best fro yo on the block. The name “Goozell” comes from the Turkish word “Güzel” (pronounced ‘goo-zel’), meaning ‘beautiful’. A Golden ticket Merchant. Mount Vernon Country Club nestled in the foothills of Golden Colorado, overlooks the city lights of Denver and beautiful mountain vistas. They’re a membership oriented private club however; the scenic facility is available for rental to non-members for weddings, banquets and business affairs. This event was very popular last year, so get there early. Tickets are $25.00 early and $30.00 at the door.